Collagen is the most common protein in the human body and provides the body’s structure and form. It’s so important that it’s often referred to as the body’s “glue”. Collagen is the majority of the protein in our bones, skin, joints, teeth, arterial walls, and other organs. It literally “holds it all together”. Collagen is formed by amino acids grouped together into chains of protein peptides, then three of these chains twist together to form “triple-helix” called collagen. This chain/coil structure gives collagen very special characteristics: the unique combination of strength and elasticity . Collagen can be elastic, like you see in skin when you squeeze a baby’s cheek. It can be solid and dense, strong enough for a weightlifter’s bones and joints to lift hundreds of pounds overhead. It truly is one of nature’s miracles. A healthy, young body produces new collagen everyday. In fact, there’s a constant cycle in the body of collagen being destroyed and created. 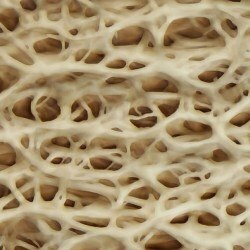 This is how bones, joints and skin stay healthy and renewed. The problem is that while the body is designed to both destroy and create collagen, production does slow down with age. The body continues to destroy collagen, but it doesn’t replace it fast enough. This can lead to a number of cosmetic and health problems including wrinkles, joint pain, cellulite, bone loss, hormone imbalances, arthritic conditions and even hardening of the arteries. Ensuring that you get adequate amounts of collagen can help to protect your long-term health, but getting it into your body can be trickier than you might imagine. It stands to reason that we expect to be able to get the majority of our vitamins and nutrients from what we eat. This is also true for collagen as the protein is found in the meat of commonly consumed animals including beef, pork and chicken, and it is even found in fish. However, the best sources of collagen are found in the parts of the animal that we often throw away – the skin, joints, bones, organs, tendons, etc – making it very tricky to boost your collagen intake through your regular diet. To make matters even worse, collagen’s triple-helix structure makes it difficult to break down through digestion alone. Beef (bovine collagen): Being such a strong and powerful animal, beef is one of the best sources of collagen. After the animal has been butchered for meat, the rest of it is often used to make collagen products (explained below). The most important thing to remember is that collagen should be sourced from beef which has been humanely raised on home pastures, is grass-fed and free of the antibiotics commonly given to animals raised in cages/close quarters. Fish (marine collagen): There is far less muscle in a fish than in a mammal, largely due to the fact that they don’t have a need to hold their own weight. Collagen in fish is usually found in the skin, bones, scales and swim bladder. Again, this means that fish-based collagen is usually processed and put into supplements. There are some reports that marine collagen is more bio-available than other forms of collagen, but this seems to be rumor as there are no credible studies to support this claim. Pork (porcine collagen): As with the others, this collagen is often made from the bones, joints and skin of the pigs after butchering. Because of many people’s aversion to eating pork, it isn’t as common as other forms of collagen. The fact is, collagen can be found in all animals and mainly in their skin, joints, bones and organs. Hydrolysis is the best method of extracting collagen from animals, and it involves heating the animal parts so that the molecules are made much smaller into what are known as hydrolyzed collagen peptides. These molecules are bioactive, which means that the body can absorb and then utilize them faster, giving you all of the health benefits of collagen consumption extremely quickly. In fact, 90% of hydrolyzed collagen peptides can be put to use in the body within six hours of ingestion. What are the health benefits of taking collagen supplements? Bioactive peptides are shown to have wide-ranging physiological functions including being anti-oxidative, anti-microbial and mineral binding. Reduced lines and wrinkles, and an improvement in skin conditions. Improved mobility and reduced arthritic symptoms thanks to supported re-growth of joint tissue and relief from joint pain. Reduction of and protection against stretch marks. Boosted metabolism which could help you to lose weight and protect you from obesity. Natural detoxification of the whole body, and in particular the liver. Improved digestive health thanks to the rebuilding of collagen in the intestinal walls. Healthy, stronger hair and nails. Hormone balance including insulin, estrogen, progesterone, testosterone, cortisol, DHEA, melatonin and even the human growth hormone. Protection of the arteries from hardening. Relief from anxiety and promotion of restful sleep. Ehlers-Danlos Syndrome – a collection of heritable connective tissue disorders. Ullrich Myopathy – a form of congenital muscular dystrophy. Alport Syndrome – a progressive loss of kidney function. Goodpasture’s Syndrome – a rare autoimmune disease which sees sufferers develop substances that attack collagen in the lungs and kidneys, causing irreparable damage and eventually failure. Atopic Dermatitis – inflammation of the skin caused by lack of collagen. Collagen Vascular Disease – otherwise known as connective tissue disease, causes inflammation in your joints. Did you know that there is more than one type of collagen? In fact, it will probably surprise you to know that there are 27 different types of collagen and these relate to the area within the body in which they are found. Type I collagen is the most prevalent type in the human body, and is found in many areas including the bones, skin and invertebrate discs. Type II collagen is found predominantly in cartilage and the vitreous humour. This type of collagen is most commonly used to treat skin problems including wrinkles and cellulite, as well as joint-related conditions like arthritis. Type III collagen is the second most abundant type in the human body, and is found in many of the same locations as type I, including the skin, muscles and also the intestinal walls. The other types are found across various bodily elements including the heart, eyes, tendons, hair and even the lining of your arteries. There is often some confusion regarding gelatin and collagen. Gelatin is actually a substance that is produced as a result of processing animal bones and connective tissue to extract collagen. Essentially it is cooked collagen, and is one way of making it a little easier to get collagen into our day to day diet. Gelatin used within the food industry usually has colorings, sweeteners and flavors added to it because it is naturally colorless, tasteless and pretty unappealing. You may be surprised at the number of food products on the market that contain gelatin, a sample of which includes: many candies, gummy candies and chews, marshmallows, some brands of peanuts, candy corn, yoghurts, cream cheese, some cereals and more. Gelatin made from animal bones is obviously not vegan-friendly. However, there are some gelatin products that are derived from seaweed that can give you the same health benefits without compromising on your ethics. There are many different varieties of gelatin, and its quality is primarily dependent on the way in which the animal used to create it was raised. As mentioned previously in this article, the very best quality collagen and subsequently produced gelatin, will be from animals that are pasture-raised, grass-fed and free from antibiotics. Broth is a popular way of getting collagen and its associated health benefits into your daily diet and the meat, poultry or fish should be cooked with the skin, bones, cartilage, tendons, marrow and connective tissues wherever possible to ensure you get maximum collagen. minerals and other nutrients into your cooking. Heating the broth helps to break down the collagen into smaller, more easily digestible molecules meaning that you reap the benefits quickly and effectively. Broth is extremely easy to add to your regular cooking too, and can be used in place of water for boiling grains or vegetables, or even tastes good on its own as a soup. Why is molecule size important? Whilst there is no getting away from the fact that any additional collagen in our diet is going to be beneficial to you, when it comes to collagen consumption, size really is important. However, in this case, less is definitely more. As covered previously in this article, heating the animal body parts during the collagen extraction process breaks the collagen down into gelatin, which is much smaller molecules. The smaller the molecules are the easier and faster that they can move around in your body and get to the areas that need it most. 90% of hydrolyzed collagen peptides are distributed around your body within six hours of being consumed. One of the biggest benefits to collagen supplements is that they are usually made up of hydrolyzed collagen peptides, meaning that you can start reaping the benefits shortly after consumption. There are several types of supplement on the market. Let’s take a look at the different varieties available. There is one major restriction of pill or tablet-form collagen supplements and this is their size. The majority of studies that have been undertaken into the effectiveness of collagen supplements focus on daily doses of around 10’000mg. Unfortunately for users, this would require taking TEN very large capsules every single day. For most people, this would be inconvenient and very off-putting. The one exception would be for Type II collagen, and this is because experts suggest that a daily dose of around 40mg would be sufficient to effectively treat conditions such as osteoarthritis and rheumatoid arthritis. By far the easiest, most practical and most popular method of consuming collagen supplements is in powder form. This eliminates the need for swallowing large capsules, and the powder can be easily added to your food or morning smoothie. It also makes it simple to get the recommended 10’000mg per day of mixed varieties of collagen, which can also be combined with a plethora of other beneficial nutrients and minerals. This ensures that you will retain the ability to re-build your vital collagen stores across your body, supporting your complete health and wellbeing. The biggest restrictions of liquid collagen are that it is normally restricted to just one type at a time (for example Type III) and again it also requires a large amount to be consumed in order to meet the recommended daily dosage – up to SIX tablespoons every day! Again, Type I is more easily consumed in this manner, as 10-40mg can be enough to have a reasonable effect. However, not all varieties are particularly palatable which can make them off-putting and unpleasant to take. Collagen supplements – alone or a mixed formula? By now you should be pretty convinced of the important health benefits that can come from collagen supplements. However, what if we could tell you that instead of just taking collagen by itself, you could also be taking a tried and tested formula of other antioxidants, enzymes, trace minerals and nutrients that can help you to absorb and effectively process the collagen and in turn provide additional benefits to your overall health and wellbeing? Many people purchase a wide range of supplements in the hope that they have all bases covered. However, with a solution like Collagen Complete you could save time and money, by reducing a whole spectrum of ingredients to just one serving of protein-packed powder each day. Collagen Complete is a complete formula designed to support collagen production and protection. It contains the recommended 10’000mg of hydrolized collagen peptides in every single serving which ensures that you have fast, effective absorption of a complete collagen profile (including types I, II, III and more!). You can be sure of the very best quality collagen as it is naturally extracted from pasture-raised, grass-fed cattle. How you choose to boost your collagen intake will depend largely on your budget, your lifestyle and your personal preferences. When it comes to staying healthy, understanding information and researching the facts is critical. In this article we have aimed to provide all of the important knowledge that you need in order to make an informed decision as to which collagen supplement is right for you, and put you firmly in control of your physical and emotional health and wellbeing. By taking steps now to protect your collagen production, you could help to ensure that you have a healthy and active lifestyle for years to come.